DURHAM, N.C. — Large swaths of DNA and its lesser-known cousin RNA are dotted by chemical tags that act like Post-It notes, providing additional instructions to the underlying genetic code. The most abundant of these RNA modifications goes by the name N6-methyladenosine, and has been implicated in a variety of biological processes, including stress responses, fertility, circadian rhythms and cancer. But very little is known about its role in infectious diseases, such as the notorious RNA viruses hepatitis, influenza and the common cold. New research out of Duke University shows that RNA viruses are littered with N6-methyladenosine tags which affect the ability of these viruses to infect cells and, ultimately, their human hosts. 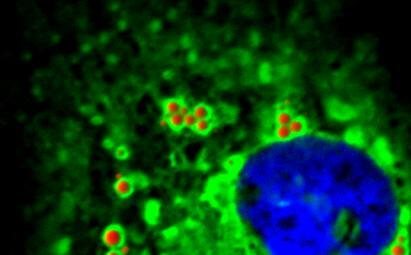 Though this study, appearing Oct. 20 in Cell Host Microbe, focused on the hepatitis C virus, it also mapped the presence of these tags in other members of the same viral family, including Zika, dengue, West Nile and yellow fever virus. The findings could point to new strategies for combating these established and emerging viral pathogens. "In the case of hepatitis C, these chemical tags seem to allow the virus to establish slow, persistent infections," said Stacy M. Horner, Ph.D., senior author of the study and assistant professor of molecular genetics and microbiology at Duke University School of Medicine. "But the other viruses harbor different patterns of N6-methyladenosine tags, suggesting that the modifications may be regulating these viruses in different ways," Horner said. "We're interested in figuring out how the N6-methyladenosine modification might regulate infection in other viruses and also how it might affect the host's response to infection. That would give us new targets for antiviral drug development." Decades ago, researchers discovered that RNA was often decorated with different chemicals like methyl, acetyl and phosphoryl groups. But without being able to map where these modifications were located across the entire RNA genome, they couldn't begin to understand whether they served a purpose or were just window dressing. Within the last five years, the development of sophisticated sequencing techniques has enabled researchers to make sweeping advances in the understanding of the fundamental role that tags like N6-methyladenosine play in biology. Most recently, Horner and others showed that this modification could enhance the stability of HIV, a virus that replicates within the cell nucleus. In this study, Horner decided to investigate the impact of N6-methyladenosine on viruses that replicate exclusively in the cytoplasm — the fluid around the nucleus of the cell — such as members of the Flaviviridae viral family. This family includes dengue, West Nile, yellow fever, Zika, and hepatitis C.
Nandan S. Gokhale, a graduate student in Horner's lab, in collaboration with the lab of Christopher E. Mason at Weill Cornell Medicine, employed the latest sequencing techniques to map the locations of the N6-methyladenosine modifications on the hepatitis C virus genome. In all, they found 19 different regions of the viral RNA that were modified. Gokhale then made mutations to inactivate the modifications at each of these regions and conducted a series of experiments to untangle which stage of the viral life cycle was affected. Surprisingly, he found that N6-methyladenosine slowed down the packaging of viral particles. Because hepatitis C is a chronic virus that infects the liver, this RNA modification might act to keep the infection in check, so it doesn't tear through the vital organ as quickly and trigger a massive immune response. After studying the role of this modification in hepatitis C virus, the researchers generated N6-methyladenosine maps of several related viruses, including dengue, West Nile, yellow fever, and two strains of Zika virus. The maps provide vital data for the exploration of different theories about the function of N6-methyladenosine in these poorly understood viruses. "One thing we can speculate about is that these modifications might regulate the Zika virus life cycle," said Gokhale. "We found that the profiles of N6-methyladenosine in different strains of Zika that have different levels of pathogenicity are strikingly different. The African strain has one pattern, whereas the Puerto Rican strain, which is closely related to the Brazilian strain that is associated with microcephaly, has another. While we don't understand what that means yet, these different distributions of RNA modifications could differentially regulate these viruses." National Institutes of Health (R01AI125416, 5P30AI064518, T32-CA009111, R25EB020393, R01NS076465, R01ES021006, R01AI089526, R01AI101431, R01DK0951250, U19AI083019, R56AI110516), Duke Whitehead Scholarship, Ford Foundation, Tri-Institutional Training Program in Computational Biology and Medicine, Starr Cancer Consortium (17-A765, I9-A9-071), the Irma T. Hirschi and Monique Weill-Caulier Charitable Trusts, Bert L. and N. Kuggie Vallee Foundation, WorldQuant Foundation, the Pershing Square Sohn Cancer Research Alliance, NASA (NNX14AH50G, 15-15Omni2-0063), the Bill and Melinda Gates Foundation (OPP1151054), the Alfred P. Sloan Foundation (G-2015-13964), the University of Texas STARs Program, the Pew Charitable Trusts (USPHS-AI07647, ACS-RSG-12-176-01-MPC), and the Burroughs Wellcome Fund. CITATION: "N6-methyladenosine in Flaviviridae viral RNA genomes regulates infection," Nandan S. Gokhale, Alexa B.R. McIntyre, Michael J. McFadden, Allison E. Roder, Edward M. Kennedy, Jorge A. Gandara, Sharon E. Hopcraft, Kendra M. Quicke, Christine Vazquez, Jason Willer, Olga R. Ilkayeva, Brittany A. Law, Christopher L. Holley, Mariano A. Garcia-Blanco, Matthew J. Evans, Mehul S. Suthar, Shelton S. Bradrick, Christopher E. Mason, and Stacy M. Horner. Cell Host Microbe, October 20, 2016.